LOS ANGELES – Sheriff Alex Villanueva Wednesday accused his predecessor of underreporting jail violence while tying deputies’ hands and leaving them vulnerable to inmate assaults, saying he will let jail guards know they have a right to defend themselves. “The conditions (in the jails) are destabilizing … this is a social experiment that people were not paying attention to,” the sheriff told reporters at the Hall of Justice, warning that deaths and even a large-scale riot could be the ultimate result. His remarks — which followed a dressing down from the Board of Supervisors on Tuesday about his reinstatement of a deputy accused of domestic violence — raised concerns that he might be signaling a plan to roll back reforms. Former Sheriff Jim McDonnell, who said he had previously refrained from comment to give the new administration time to settle in, weighed in on Facebook. His charts showed a 99 percent increase in use of force incidents from 2013-18 and a nearly threefold increase in assaults on deputies during the same time period. The data around the use of force is complicated because new reporting policies were instituted in 2013, which county officials have long said created a spike in reporting that wasn’t reflective of a jump in actual force incidents. On top of that, mismatched systems for reporting different kinds of force and violence have created inconsistencies and unreliability in the numbers over time. 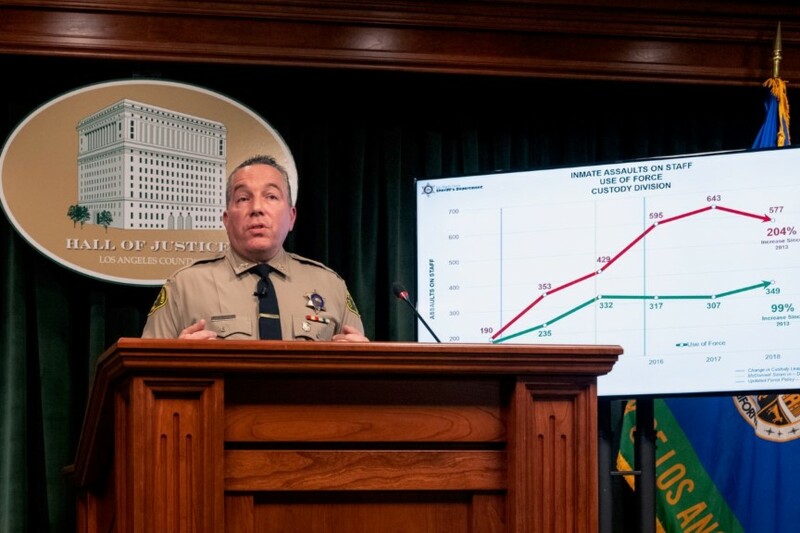 The Sheriff’s Department could not immediately provide the methodology behind the charts, but both the Office of Inspector General and a court- appointed monitor said they believe that reforms have paid off and abuses have been curbed. “The use of significant force by law enforcement personnel is down, particularly the most serious use of force is way down over the last five years,” said Richard Drooyan, who led the Citizens’ Commission on Jail Violence that recommended reforms in 2012 and continues to monitor the jails. Drooyan also pushed back on the idea policies instituted by McDonnell leave jail guards defenseless. Peter Eliasberg of the American Civil Liberties Union of Southern California said he hoped Villanueva was not suggesting that the way to run a jail system was by using threats of force, rather than conflict avoidance skills. Villanueva and watchdog agencies do agree that the dramatic increase in inmates with mental health issues creates more problems in managing the jail population. However, Assistant Inspector General Cathleen Beltz said the solution is to stay the course. McDonnell and former custody chief Terri McDonald both urged independent fact-checking of the data, with the former sheriff taking a harder stance and noting that multiple outside agencies had closely monitored his department. “Sheriff Villanueva is entitled to his own opinion, but not his own facts,” McDonnell said. Villanueva beat McDonnell in a longshot bid for sheriff at least in part due to an endorsement from the Association for Los Angeles Deputy Sheriffs. On the campaign trail, he talked about bringing back metal flashlights in the jails despite their potential use as weapons and styled himself as a champion of the rank-and-file. But he also said he was a reformer who wasn’t afraid to speak out, leading some criminal justice advocates to lean his way. On the job, the new sheriff doesn’t seem to shy away from a fight. He spent Tuesday going toe-to-toe with the Board of Supervisors about his reinstatement of Caren Carl Mandoyan, who played a key role in persuading deputies to rally behind Villanueva’s bid. The Los Angeles Times reported this month that Mandoyan was fired in 2016 by McDonnell after a fellow deputy alleged Mandoyan grabbed her by the neck, tried to break into her home twice, sent her harassing text messages and admitted to listening to her conversations. A county appeals board heard evidence in the case and upheld Mandoyan’s dismissal on a 5-0 vote. Prosecutors investigated the woman’s claims and looked at video evidence in the case but declined to charge Mandoyan with intimate partner violence. Comments Villanueva made to the Civilian Oversight Commission about the reinstatement led Supervisors Kathryn Barger and Sheila Kuehl to call for a board letter expressing “grave concerns” about his attitude toward victims of domestic violence and asking the sheriff to reconsider. But Villanueva doubled down, alleging that the Civil Service Commission had ignored a “mountain of (exculpatory) evidence” in the case and telling the board he was certain they would change their mind once they knew all the facts. He said he had another half-dozen cases in which he expected to overturn the hearing board’s decisions and is planning to set up a “truth and reconciliation” group to rehear wrongful terminations dating back as far as 2013, potentially bringing back deputies with back pay. The five-member Los Angeles County Board of Supervisors has little direct control over the county’s top cop, but Kuehl issued a warning. “None of us is so independent that we can do anything we damn well please,” she told the sheriff. The board voted to send the letter urging reconsideration and asked county lawyers to assess what recourse they have in settling a conflict between the board and the sheriff. A day after assuring the board that Mandoyan would waive his rights and release his personnel file to set the record straight, Villanueva said the deputy had changed his mind. 3 comments for "Sheriff signals policy changes, watchdogs worry"
The deputy changed his mind. AS LONG AS HE OPPOSES DONALDS CHUMP POLICIES THE MAJORITYOF 98% OF LA COUNTY VOTER THAT VOTED FOR VILLANUEVA COULD CARE LESS ABOUT THE INTERNAL POLITICS.